ROV stands for Remotely Operated Vehicle. It is an underwater robot, sometimes known as a remote controlled submarine, controlled by pilots on a ship. The ROV is connected to the ship by a cable, called an umbilical, that contains lines running communications and power to the vehicle. What is the difference between an ROV and AUV? 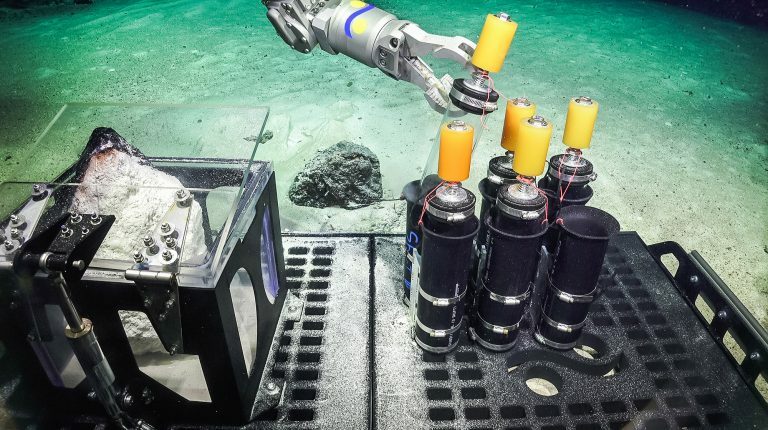 For the most part, ROV’s are piloted in real time by an operator, while AUV’s are usually pre-programmed to conduct missions with little or no surface intervention. There are also hybrid ROV’s that can act in both an AUV and ROV mode. Typically, AUV’s and ROV’s are used for different purposes, but can be used in tandem to gather a full suite of information needed for a particular underwater area. AUV’s are generally programed for specific tasks, such as high resolution mapping, photogrammetry, or collecting water measurements. Once completed, the AUV will return to a predetermined location where it is recovered by researchers who can then download and process the data gathered. An ROV might be deployed after the AUV to get real-time video and physical collections of the environment. Although some people use the term “robot” to describe a ROV, the term is more commonly used to refer to AUV’s (Autonomous Underwater Vehicle) since ROV’s have a human operator or pilot and AUV’s do not. How many people are in the ROV? ROVs are unmanned, hence the “Remote” part of the name. There are several advantages to not sending humans down in the vehicle, primarily safety and longer diving time (up to many days at a time), allowing a continuous stream of imaging, observation, and sampling opportunities. What is the longest time you have been diving for? 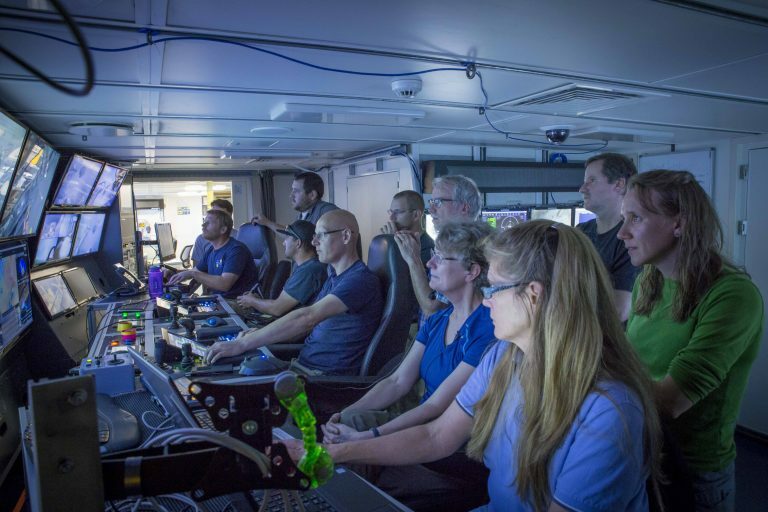 Dive length depends on factors like depth and weather, but as long as there are no technical operations, there are no limits on how long an ROV can stay down. On average, dives typically last around eight hours. In comparison, a dive in a human occupied vehicle typically lasts five hours. How did ROV SuBastian get its name? Like research vessel Falkor, ROV SuBastian was named after a character, Bastian, in the German fantasy novel The Never Ending Story. The name is a play on words, as the vehicle is going “sub” surface. Research vessel Falkor also has a work and safe boat named Atreyu and Auryn. Michael Utley, bosun, helps position ROV SuBastian on deck after a recovery. How big is ROV SuBastian and how fast/deep can it go? ROV’s can vary in size, ranging from a shoe box to a large van depending on the type of mission it needs to accomplish. 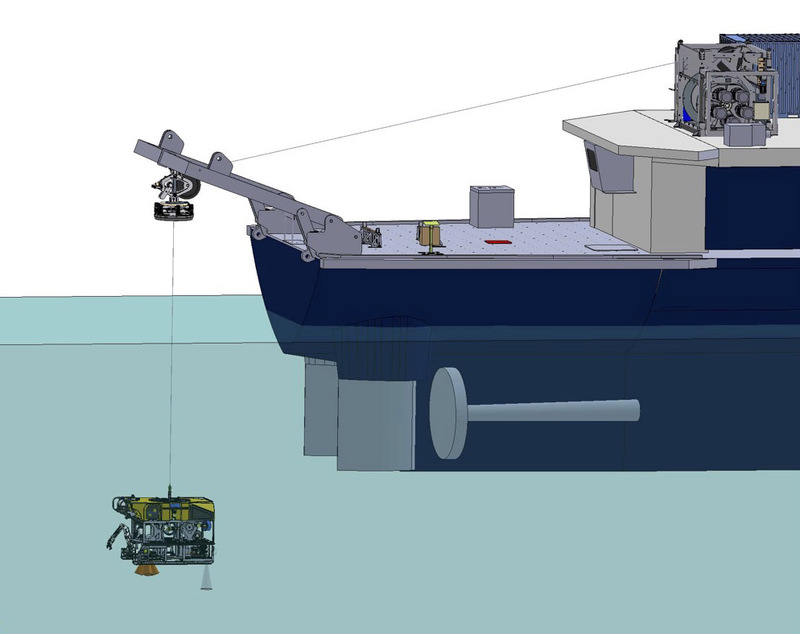 ROV SuBastian is 2.7m x 1.8m x 1.8m; about the same size as a subcompact car. In air it weighs 3,200 kg., and although this seems like a lot, most of the weight is flotation and will become positively buoyant or neutral weight in the water. The ROV is equipped with five powerful thrusters (just like propellers) that move the vehicle; one thruster moves it sideways, two move it forward and back, and another two are used for vertical movement. ROV SuBastian can go down to a maximum operating depth of 4,500 meters and transit at a speed of 0.5 – 3 knots, depending on depth and currents. For specifications on ROV SuBastian, please visit here. How many people are needed to operate the ROV? The person operating an ROV is called a pilot. This is because they can technically “fly” the vehicle in all three dimensions – something we can’t do with other ocean equipment such as a CTD. At a minimum, SuBastian requires three to four people to manage the vehicle offshore, including two ROV pilots to “fly” it. There is always a lead pilot, but if there are arm manipulations needed, the co-pilot will help. The co-pilot also keeps an eye on vehicle position. There will also be several scientists who sit with the pilots in the multi-screened control room. They will be taking notes to augment the recorded data and footage, watching the video feed and making decisions, including navigational courses and sample selections. Before and after every dive, the ROV’s systems are rigorously checked and maintained. Our crew has a diverse background to help with the ROV and our research vessel Falkor. You can learn more about our team here. Do I need to take special classes to learn how to operate an ROV or be part of a team? There are classes, courses, and schools that specialize in ROV training. Check out our Education Page and Ocean Resources for insight into education and training for careers at sea. 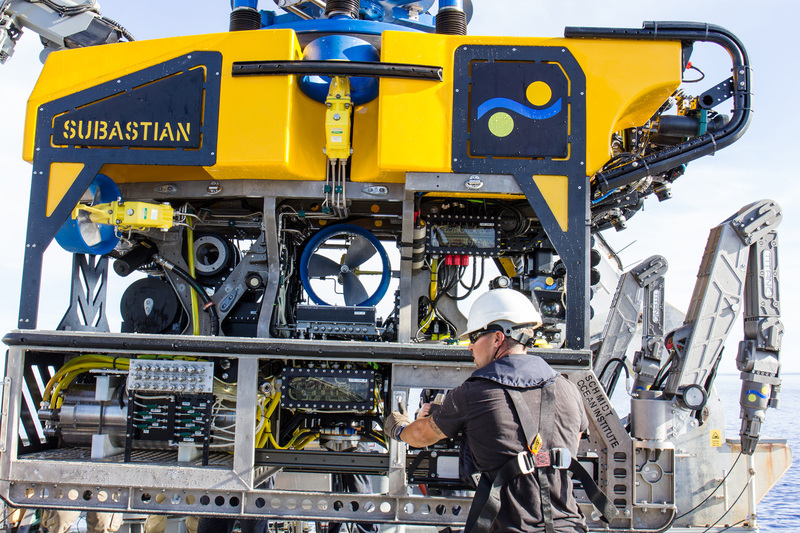 To learn more about how ROV SuBastian was built, you can watch a 16-part video series here. How does ROV SuBastian return from a mission? 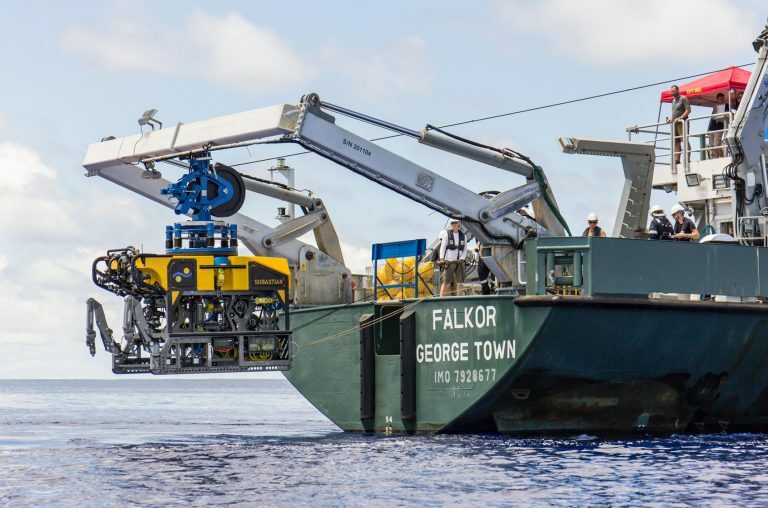 ROV SuBastian uses its navigation instruments and thrusters to ascend to the ocean surface and is then carefully lifted back onto research vessel Falkor with a powerful winch and the ship’s A-Frame (crane). 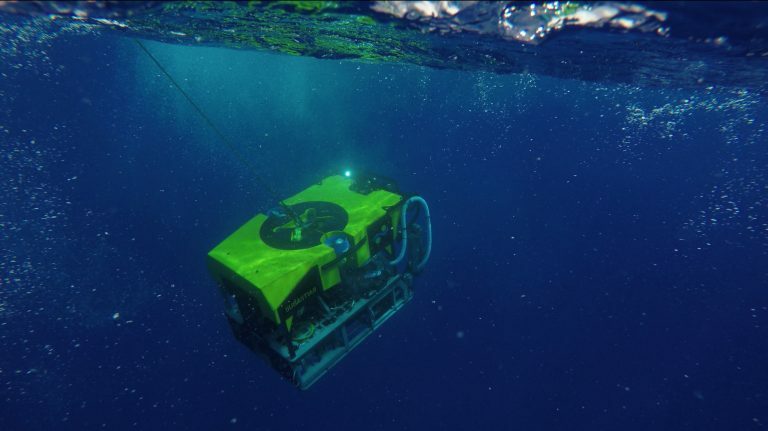 Some underwater vehicles need to release weights to make them lighter so they can come up to the surface, but ROV SuBastian does not dump any weight to be left behind on the ocean floor. Can I see ROV SuBastian in action? All of SuBastian’s dives are livestreamed and stored on the Schmidt Ocean Institute website and YouTube page. All live dives will be announced on our website and social media pages. To view photos and videos of ROV SuBastian please visit our gallery here. What instruments are on ROV SuBastian? Most ROVs are equipped with a selection of video cameras and lights. Additional equipment is commonly added when required to expand the vehicle’s capabilities. These may include sonars, magnetometers, a still camera, a manipulator or cutting arm, water samplers, and instruments that measure water clarity, light penetration and temperature. ROV SuBastian is equipped with numerous video cameras that allow the operators to monitor what is going on around the vehicle in real-time. This includes a pilot camera used by the pilot when flying the vehicle, a movable camera used by scientist to look at interesting features, an upward looking camera to monitor the cable, and a rear looking camera to make sure the back is clear. There are also various cameras to aid manipulator operations and monitor systems on the vehicle. In addition to our permanent cameras, SuBastian can also be fitted with specialist imaging systems supplied by visiting scientists. SuBastian is designed to be modular and has a large payload, which means tools can be added as needed. SuBastian is outfitted with instruments on each cruise depending on the scientist’s goals, and we integrate whatever equipment the scientists can dream up. You can view SuBastian’s standard instrumentation here. Why are you taking pieces of coral and other biological samples? Some samples need to be delivered to the scientists back onboard for further research. Other samples and measurements can be gathered “in situ” (meaning in the water) such as temperature readings. Click here to learn more about why we sample.